In only a couple of weeks, Savile Row will once again come together to exhibit the finest tailoring in the world at London Collections: Men. Combining with London’s best shirt makers, shoe makers and hatters, the presentation will display the finest craftsmanship and British elegance to an ever increasing international audience. 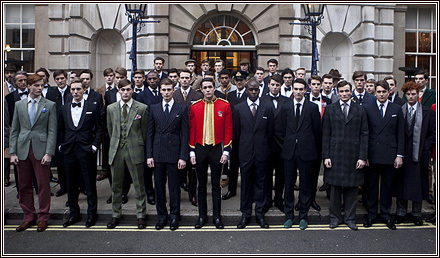 London is the world capital of masculine style, and has been for over two centuries. Now in its 2nd year we will continue to present our collections in the most iconic and exclusive settings of London. On 17TH June, the English Gentleman at Lord’s Cricket Ground will take the form of a presentation featuring a mix of models and other men. With over seventy different outfits to be shown, spread through the famous rooms and terraces of the Pavilion, we are hard at work making a number of looks to combine with those exhibited by other houses. The clothes will range from cricket sweaters to summer sports jackets, blazers, light weight suits, flannel waistcoats with trousers. It will be the epitome of Englishness in the most English of settings. The presentation will be styled by Jo Levin, Creative Fashion Director of British GQ Magazine.